Don’t you love clearance sales? You had your eye on that adorable handbag (or European carry-all) and just as you are ready to buy it, the store announces it is dropping prices by 30% to make room for new inventory. Score! But act fast, because prices this low won’t last. But like any good sale, these cheap prices aren’t likely to last for long. If you’ve been thinking about buying some precious metals but were hesitant because they were trading at all time highs, now’s your chance to jump in. That’s not to say the prices can’t drop even further. But, if they do, precious metals investors will rejoice and thank their lucky stars that they can buy more at even cheaper prices. So what caused such a sharp drop in prices? Did the fundamentals change overnight? Did someone discover a giant gold deposit in a cave? Did Congress balance the budget and devise a plan to reduce the debt? Did Ben Bernanke decide his life’s research on the Great Depression was misguided, and that the Depression wasn’t caused by a lack of money printing? Did Europe solve its sovereign debt and bank contagion problems? Actually… no. None of the fundamental reasons for believing that currencies around the world will continue to be devalued have changed. What has changed are some temporary factors that influence the gold speculators who determine the market price. The September 22 Federal Reserve announcement had two main takeaways. First, they would commence “Operation Twist,” a plan to sell short-term Treasures and buy long-term Treasuries. Second, that the economy was worse than they previously thought. Operation Twist had already been baked into market expectations as a minimum level of Fed action. The lack of additional stimulus and the negative outlook disappointed the market, sending stocks and commodities lower. This sharp decline forced many stock traders using options and leverage to raise cash to cover their bets, and many did so by selling their positive gold and silver positions. Another factor fueling the decline was that the CME group hiked gold margin requirements by 21% and silver by 16% on Friday. CME has hiked gold margins three times by a total of 55% since August 11. Then on Monday, the Shanghai Gold Exchange followed with a silver margin hike of 20%. When the exchanges hike margins, leveraged traders are forced to liquidate some of their positions to add capital to their accounts. This forced selling temporarily drives down the price but reinforces a more solid base to the precious metal prices by reducing leverage. 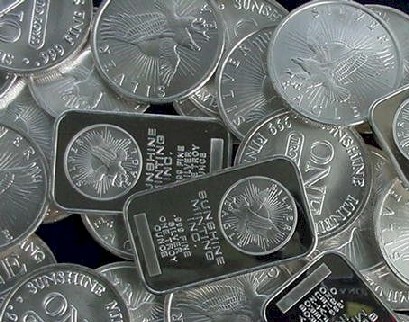 Meanwhile, as prices were dropping in the paper silver markets, savvy investors were swooping in to buy physical silver. Understand the fundamental reasons for owning gold and silver. If you don’t understand why you are buying gold, you are more likely to sell in a panic when prices drop by 20% or 30%. By knowing the history and fundamentals, you will also know when it’s time to trade in your gold for other assets. Don’t use leverage unless you truly know what you are doing. Gold and silver will have tremendous gains all by themselves. Don’t risk getting squeezed out of a winning bet because you got too greedy. If you feel you need leverage, add some quality mining shares to your holdings. Buy physical. The world is awash in hundreds of trillions of dollars (you read that right) of paper derivative assets. Physical precious metals are one of the few investments that doesn’t have counter party risk. It would be a shame to think you have gold only to find out it was a paper promise of gold that can’t be fulfilled. Diversify your gold holdings. There are many ways to own physical gold both inside and outside the country. You can buy coins and bars to store yourself, pay for segregated vault storage, open a goldmoney.com account, and buy PSLV and PHYS shares, to name a few. Buy a bit each month and buy the dips. Timing is hard. If you try to get cute you could miss a big run up or buy at a peak. Forget all that. Just buy what you can afford at periodic intervals to dollar cost average, and watch it rise in value over the years. If you follow these simple rules, you will grow to love these weeks when silver and gold get hammered. These 30% off sales just allow you to accumulate that many more ounces. Keep stacking. This entry was posted in Investing and tagged clearance sale, CME group, gold, Krugerrands, margin requirements, silver, Silver Eagles. Bookmark the permalink. 3 Responses to Silver Liquidation Sale!!! Save 30%!!! Everything must go!!! Pingback: Bull & Bear Essentials » Blog Archive » Why Did Silver and Gold Plummet? First off I would like to say awesome blog! I had a quick question in which I’d like to ask if you do not mind. I was interested to know how you center yourself and clear your thoughts before writing. I have had difficulty clearing my thoughts in getting my ideas out there. I do enjoy writing but it just seems like the first 10 to 15 minutes are generally wasted simply just trying to figure out how to begin. Any recommendations or tips? Thank you! Usually when I’m sitting down to write an article I have a bunch of ideas and points I want to get across. What I do is just jot down all of the ideas quickly as they come to me without worrying about the wording. If I do happen to think of some particular wording I like I will write that down as well. Then when I have written down all of the relevant points I will organize them into an outline. Basically a skeleton of what I want to say. Once I have figured out everything I want to say and in what order I want to make the points, then I go back and fill in the gaps and write the article referring back to my outline. It’s easier to write one paragraph at a time. Then I will wait a few hours (ideally wait a day) and go back and reread it and edit out all of the stuff that doesn’t quite work. Cutting out stuff is the hardest, yet most important part. I hope that helps.